There was a time when “stout” was an indispensable beer style for practically any brewery. Not “imperial stout,” mind you—just that beer style we once referred to simply as STOUT. Maybe it had a single modifier, like “oatmeal stout” or “Irish stout,” but that was about it. At practically any neighborhood brewpub, you could expect to see a more or less session strength stout in attendance, situated next to a suspiciously similar porter. Those days, obviously, are long behind us now. Non-imperial stouts have undergone quite a lot of change in the last decade, decreasing in prevalence while increasing in diversity. As the world of “prestige stouts” expanded and gigantic, barrel-aged dessert beers became ubiquitous, it was these types of beers the consumer began to associate with the word “stout.” A lower-ABV stout simply seemed superfluous, especially when the role of that beer in a brewery’s lineup could be filled in most cases by a porter that would be perceived as more approachable than “stout” by the rank and file. The result is a vastly reduced field of non-adjunct stouts, as evidenced by categories such as GABF’s “American-style stout,” which drew a paltry 60 entries this year. The reality is that stouts of less than 8% ABV have now become canvasses for the use of various flavorings and adjuncts. Yes, you can still find the occasional “American stout” or plain old “oatmeal stout,” but chances are much better that beer now has coffee, or vanilla, or spices, or fruit, or even barrel-aging to justify its existence. If “porter” now fills the role of “session-strength dark beer” for many breweries, then non-imperial stout facilitates flavor experimentation. This hypothesis certainly held true in the beers we received for this blind tasting. There were milk stouts and fruited stouts, artificially flavored monstrosities and beers meant to evoke various dessert items. There were coffee beers out the wazoo. And we found a ton of great ones along the way, but we’d be lying if we said we didn’t miss those old “American stout” days from time to time. But enough reminiscing. Let’s get to tasting. 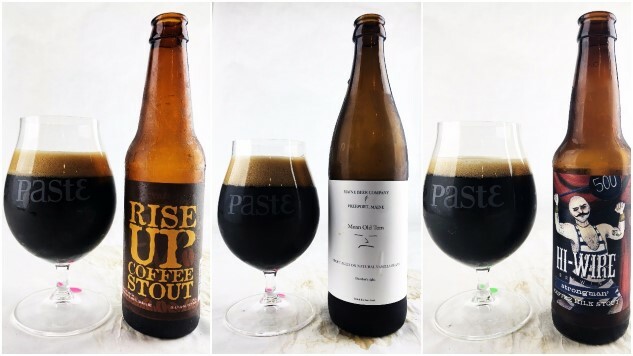 As in most of our blind tastings at Paste, the vast majority of these stouts were sent directly to the office by the breweries that choose to participate, with additional beers acquired by us via locally available purchases and the occasional trade. We always do our best to reach out to breweries we’re aware of that make exemplary versions of particular styles, but things always do slip through the cracks. We apologize for a few significant omissions that we couldn’t acquire, either due to seasonality or market shortages. There will never be a “perfect” tasting lineup, much as we continue to try. - This is a tasting of stouts, largely determined by how the breweries chose to label their products. To be admitted, it had to be labeled as stout—no porters under any circumstances, as we will be blind tasting porter in the spring. They also had to be under 8% ABV—all beers 8% and over were eligible to be part of our imperial stout tastings instead. When in doubt, we simply allow a brewery’s marketing to define a beer’s style, and expect them to stick to the designation they’ve chosen. We won’t lie to you: There are some not-good stouts in here. Because this is a style that American brewers have come to use as a testing ground for crazy flavor combinations and ultra-sweet dessert beers, we encountered our fair share of unpleasant stouts. Most of those ones were bad because they were so hopelessly out of balance—the kinds of beers that might be acceptable in a 3 oz pour, but would be impossible to drink in a full serving. On the other hand, most of the beers here in The Field are stouts that we would be perfectly happy to drink on most occasions. The nice thing about stout, when made well, is that it’s actually a very approachable and versatile beer style. Don’t make the mistake of thinking that stout is only for dessert, or only for the winter months. As far as we’re concerned, every season is stout season. As always, I’ll remind you that the beers listed below are simply presented in alphabetical order, and as a result are not ranked. I repeat: These beers are not ranked.